I always find it funny when someone says to me: "You really eat ______!" No silly, I just post it on Instagram and pretend. YES...i eat that!!!! I eat burgers, bagels (OK - scooped), french fries and gasp.....pizza! I am that boring nutritionist who thinks ALL foods can fit. As I always tell my patients, it's what we do the majority of the time that matters most. So having a bacon cheese burger with fries for lunch on a Monday, three slices of pizza for dinner on Tuesday, 1/2 pint of ice cream for dessert on Wednesday, etc., would not be at all what I mean! Remember in healthy eating, consistency NOT deprivation is what wins!!!! It's been a busy week. During the month of August my house sometimes can seem like a B&B with me being the housekeeper, chef and social director! Now don't get me wrong -- I LOVE when friends or family visit, but is sometimes hard to stick to one's normal schedule of work (since I work from home) and meals (some guests really enjoy trying new restaurants!) I'm pretty good at sticking to my yoga schedule, since anyone who visits knows that it is non negotiable. (Yes Mom - I'm talking to you!) As I always tell my clients, it doesn't really matter if temporarily you veer off course - what matters is how quickly you can get back on!!! I cannot believe that it is August. The summer seems to be flying by and there is nothing I can do about it. Unless of course I moved somewhere where there is "summer" type weather all year round? Hmmm, suggestions anyone? In the meanwhile (and back to reality) I feel like starting the new month by setting some records straight, again: 1. Not all diets are created equal; and 2. Know from where you get your diet information from. I also thought, totally not related, to throw in a cute new bag recommendation to help carry stuff, because schlepping shouldn't be so boring! When the thermometer hits 90 degrees, the heat is on - literally! Honestly, I love the hot weather. Sometimes I think I should move to Costa Rica where I can wear little dresses and flip flops all year round, and never need to put a jacket on at night. Covering up my cute dress, because air conditioning makes me freeze, always bothers me! Anyway, not everyone I know agrees. And this past week has been a killer for most. What to do? As much as I would love if you could all make it to the beach or pool I know that isn't possible. Air conditioning surely helps as does staying hydrated. Or just remember this too shall pass! (Wise words from my grandmother Shirley!) Personally, I decided to experiment in the cocktail department and create a refreshing sangria. You can thank me later. Also, this week I share some important info on a trendy ice cream and give a little yoga love. I was doing an interview this week and the journalist asked me the following question: "What are your top tips for people trying to get their bodies "summer ready"? First off, I had to laugh. Then I gave my reply: "It's the second week of July - if they aren't summer ready yet what are they waiting for?" But then I turned the conversation serious. The thing is, this "summer ready" in a question, really bothers me. Shouldn't our bodies be ready ALL year round and not because of a time of year or an upcoming event? Truth is, we shouldn't start eating better or trying to lose weight just because something lies a head, we should be doing it ALL the time. Because life is what lies ahead; AND every day, week, month or year there is a reason for us to be in the best health we can be. The weather this week has been crazy. One minute it was almost 90 degrees and then it was in the low 60's. It kind of makes you feel that nothing that you know to be true, is true. Shouldn't we be able to count on weather in the high 70's and 80's in the summer? Maybe not. At least not in the hamptons! I almost feel this can be the same in our food world. Sometimes what we think to be a fact, isn't at all a fact. Eat pasta, gain weight? Hmmmm, NOT necessarily! So in today's The Keri Report, I am sharing 2 articles I am quoted in with you to help you look at things (foods) differently. And the biggest shocker this week- take your hubby with you to a health event and find a product of the week that you BOTH agree on!!! Another holiday weekend gone by. I don't know about you, but I already feel like before we know it, it is going to be Labor Day. Ouch! Anyhoo - really trying to stay in the present and enjoy the rest of the summer. With that in mind, it definitely means a lot more BBQs, yoga outdoors, and the endless possibility of water activities. Yes, surprisingly this past week, I ventured into the waters with my husband, sister, and brother-n-law on kayaks. Whoever thought I was a creature of habit was dead wrong! So, this week in The Keri Report I wanted to give you a little more help on navigating BBQs and a little love for two foods that might not be part of your normal routine. For me, the summer is a time for a lot of house guests (much to my husband's chagrin!). This year it started early - the week before Memorial Day. Since I pride myself on being the perfect host, I always try and make sure that my guests have their "go to foods", especially for breakfast. There has been a lot of debate in the news over the last couple of months regarding the importance of breakfast. The breakfast "naysayers" arguing that it does not help with weight loss. Honestly, who cares? I think more about the nutrients that may be missed and the lack of energy. (Yep, still don't think coffee IS breakfast.) Anyhoo - this week I give smoothie tips, product advice and share an interview that talks about foods to start your day. As we welcome the summer solstice and the “official” start of summer, it’s time to relish in all things of this season. Right now, there’s nothing like a visit to a great farmers market where you can stock up on fresh, seasonal produce and lots more! Read on for what I, and my fellow nutritionists, buy at our local farmers markets. 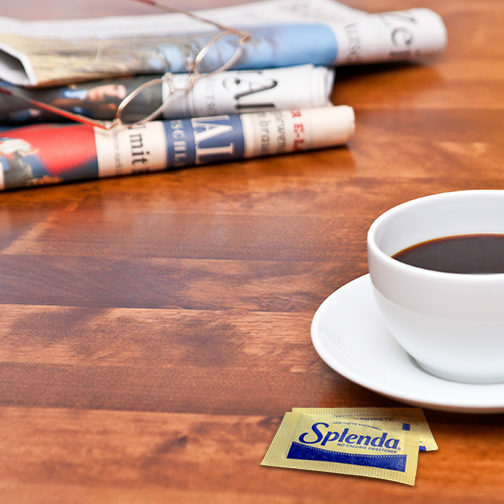 Plus, I’m setting the record straight about artificial sweeteners, AGAIN! It is iced coffee season, after all.